This is the book that thousands of kid show magicians believe is the 21st century's bible of kids magic. Do you want to learn how to be a great magician for children? Seriously Silly has the answers. This is a complete guide to performing magic for children by New York City’s top kid show magician. David Kaye has been featured on television, in newspapers, and many magazines. Between the covers of this well-written, highly illustrated book, he shares his secrets of success. It features six never-before published routines, 27 secrets of funnier routines, 7 essays, plus 21 tips to keep parents from talking during your show! Read this book, take his advice, and your shows will improve. That means your demand will increase and you'll do more shows! Unlock the top ten keys to performing memorable children’s magic. Get the secrets to making parents laugh, too, so you get hired again and again. Solving the top ten problems of performing for children. BONUS: Includes behind the scenes stories of working the parties of Madonna, Bruce Springsteen, Susan Sarandon, and many more. Seriously Silly was the first time David Kaye released his routines to the magic community. These are his favorite routines from his own hugely successful show. When you learn and perform them, you may well find that they become the funniest routines in your repertoire. Each routine is well-Illustrated with drawings or photographs. Five minutes with The Milk Pitcher that will change your show completely. Win your audience over with a charming routine for very shy children. Even kids as young as three can be stars in this trick. Now you can have his secrets to successful kid show magic in one idea-filled, easy to read volume. 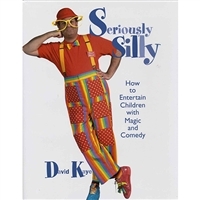 Read reviews of Seriously Silly! M.U.M. Magazine: "I believe that every kid show magician will benefit from reading this book. David’s full-day workshop at the S.A.M. Convention was extremely popular. Now he shows a fine talent for writing and teaching the rest of us the elements of performing magic for today’s kids. This is a wonderful book." The book contains new, unpublished information. However, this book also contains all the information from David's lecture notes: Kid Show Kliff Notes, How to Perform the Perfect Kid Show Trick, and Solving the Top 10 Problems. All of it has been greatly expanded and updated.